These would have to be my favourite chairs! I bought them about 6 years ago in Auckland for $12 a piece. The brand is AIREST - 'The Furniture with a Future'. They are definitely keepers, not only because they are sooooo comfy, they are also the easiest design to recover for a completely different look. So when we moved back to Australia they had to come for the ride! The first time I recovered the chairs I used IKEA fabric, and it was my first ever attempt at recovering anything and I was pretty impressed with the transformation. This time my friend Moyra offered to help me recover them with my new Mini Moderns fabric from the UK. I totally welcomed the offer with open arms, as I found the whole cutting the fabric thing quite stressful... I didn't want to make any errors as it wasn't a case of just popping back to IKEA for more. 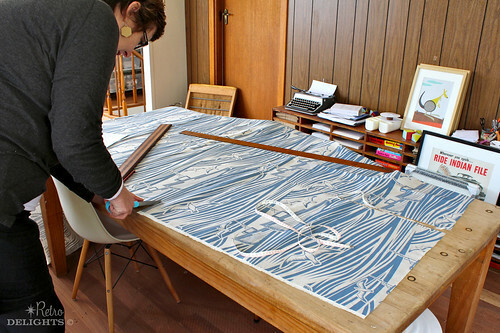 Moyra carefully measuring and cutting our 3 meters of Mini Moderns 'Whitby' Linen. So on Saturday we set to work, and I let Moyra work out the best use of the fabric making sure the pattern was up the right way! I was very happy to not think too hard about this part and leave it in Moyra's capable hands! We each sewed a back cushion cover, and then while I was busy doing the staple closure, Moyra set forth and finished the seat cushion covers for me. 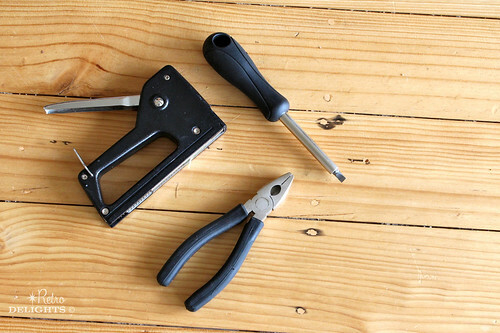 Tools - flat head screwdriver, pliers, and a staple gun. The seat back... all old staples removed. 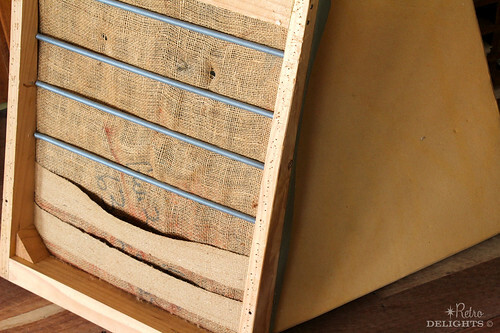 I used the staple gun to close the cover at the base of the back cushion where it is not seen. The best way to approach a job like this is to firstly remove the old covers and cut a new template from this. 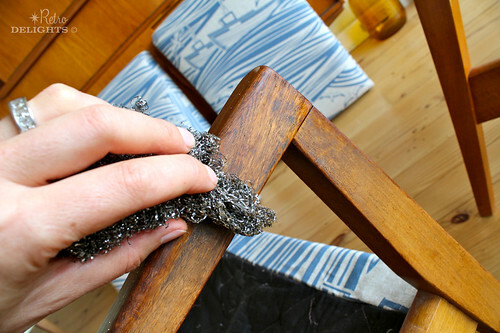 It also helps to remove all old staples etc from the frame to prevent future hooks in the new fabric. 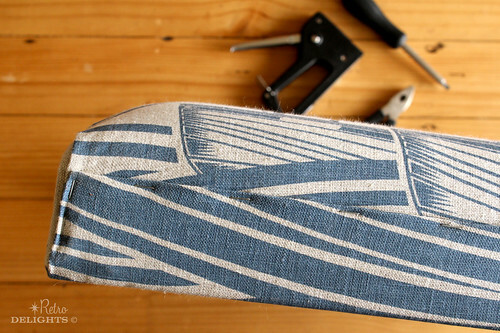 Sewing compete, now time to focus on the frames. With the sewing complete, my next focus was to spruce up the frames. Since owning these chairs I realised I had never shown the frames any love, so now was the perfect time while the chairs were sitting in pieces. Wax and grime build up. 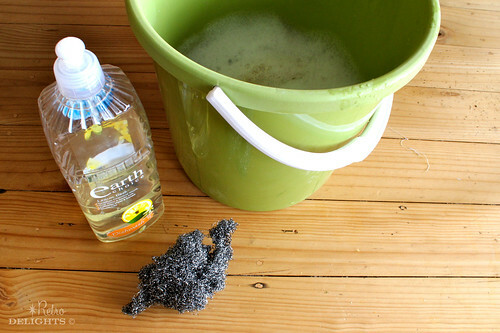 Warm soapy water does the trick. A light buff with a scourer along the grain for stubborn spots. 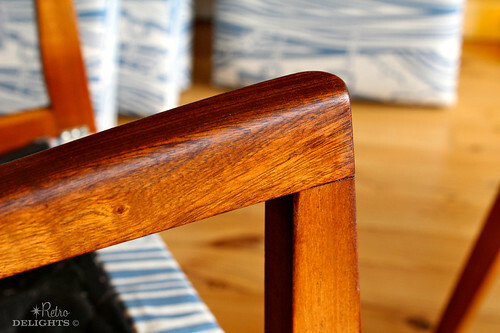 Looking a bit closer, I noticed there were patches of grime / wax build up on the teak frames. The simplest solution for this is to use some warm soapy water (I used dish-washing detergent) and a bit of elbow grease. And for the stubborn spots, a light buff along the grain using a scourer did the trick. 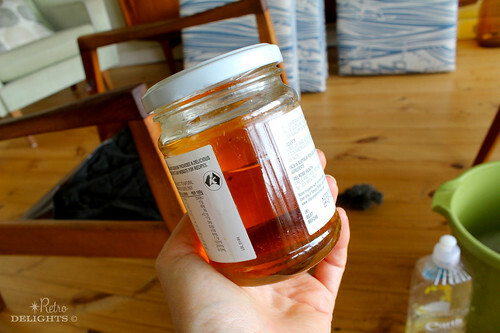 A drink of Danish oil. 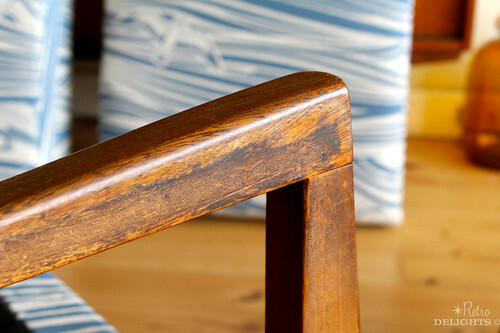 The result - the beautiful rich teak now revealed! And finally, I gave the teak a nice coating of Danish oil with a rag, let it soak in, repeated this step and then gave the frame a quick buff with a clean rag revealing the beautiful richness of the teak. Alternatively, if the frame is really dry and rough, then I would lightly sand the frame with a fine sand paper before applying the oil. 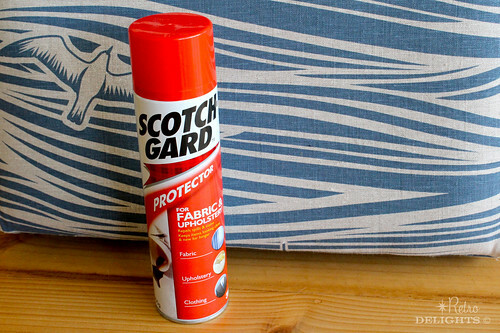 Scotch Gard from the supermarket to protect the fabric. The re-assembled chair ready for it's new home. Love it! 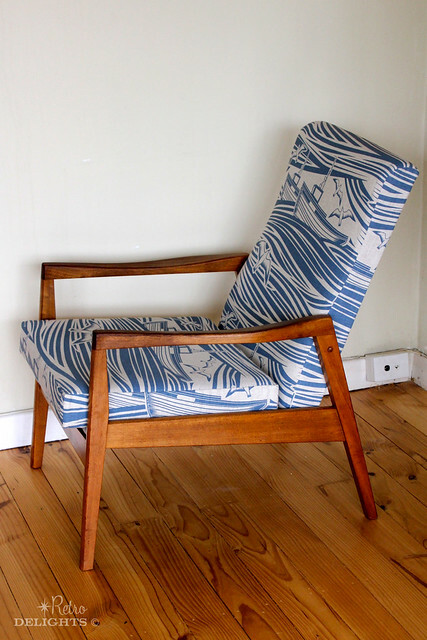 The Mini Moderns linen fabric is a lovely oatmeal coloured base-cloth that has been screen printed. The texture will hide any dirt/dust build up pretty well, but Moyra suggested that I should scotch guard the cushion covers. Considering this fabric was a bit of an investment, I liked the idea of making it easier to clean and extending it's life! So I ended up doing 2 x light coats today, waiting 1.5 hours in between coats. I recommend doing this outside in an open space so you don't inhale the fumes. 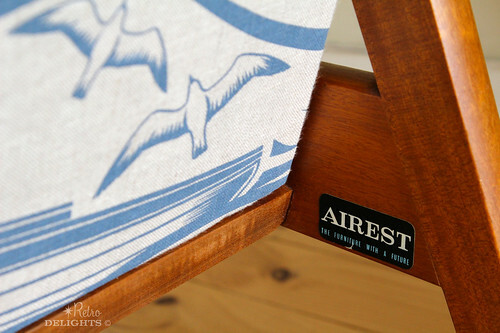 The original chair brand - AIREST. The strapline for AIREST... 'The Furniture with a Future' is so true to it's marketing word! 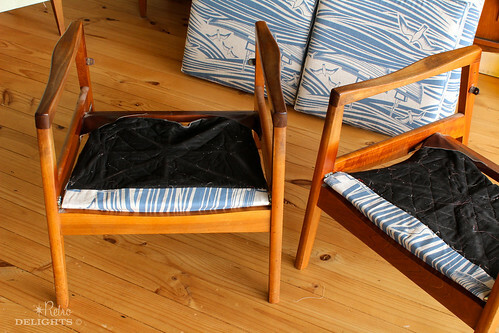 These chairs are now up to their third life, and I see them having many more in the future! The furniture manufacture probably had no idea they would be still going strong well into the 21st century! A life long shell collection. And something terribly cute to finish off. When my Mum heard that I was going for a retro beach-side theme in Denis's Photo studio, Mum decided she had the perfect gift for us - her life long shell collection! When she gave it to us, I looked at it and thought how amazing it is to think that these shells were individually picked up and carefully carried home and stored in this bottle by my Mum who is now 75 years old. 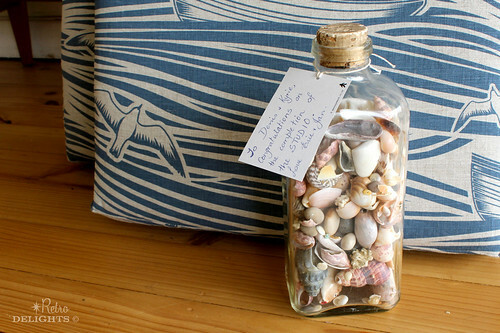 Lot's of memories in this jar - and I am sure if I asked her, she probably knows the story behind most of these shells! I also recognised some of the shells that I collected when I was a kid on our annual West Beach holiday. I would often sit and stare at this jar in wonder, looking at the colours, shapes and their beauty. It is Mum's contribution to the studio, which is very near completion (more about that in another blog post). Oh how special and cute! I can't believe what a great price you got these chairs for, they now sell on trade me for over 600 a pair. You did a great job in covering and sprucing up.